The DPRK threat ensures that the original purpose of the alliance remains relevant. This is the fifth article in a series on the U.S. alliance with South Korea. Previous articles can be found in The Diplomat’s Koreas section. 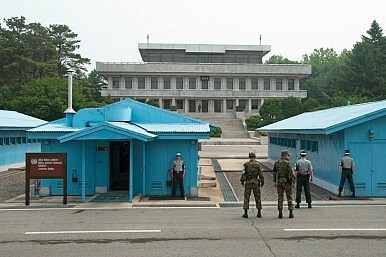 Although the alliance has changed substantially since its Cold War origins, it is still grounded in protecting the ROK from DPRK attacks or invasion. While most U.S. Cold War adversaries have abandoned communism, or in the case of the PRC an ideological commitment to conflict with imperial powers, North Korea has not changed its ideology or hostile stance to the outside world. Even while North Korean citizens suffer from hunger and privation, the Kim regime spends an estimated 22.9 percent of its GDP on defense, the highest percentage in the world. In addition, despite North Korea’s relatively small size, it has one of the largest military forces in the world, with an estimated 1,190,000 troops in 2012, as compared to the 639,000 ROK troops. While it is true that many North Korean troops are less well nourished, trained, or equipped than their ROK or U.S. counterparts, North Korea maintains a 100,000+ large detachment of Special Operations forces trained to infiltrate into South Korea, attack strategic infrastructure, carry out assassinations, and potentially act as a delivery mechanism for a biological or chemical attack against the ROK. Making the DPRK threat more acute, the DPRK has positioned most of its forces and artillery south of Pyongyang and in close proximity to the DMZ, meaning that a DPRK attack could occur with little warning. Beyond conventional forces, North Korea’s missile and nuclear program is a major threat to South Korea, as well as Japan and others in the region. According to the Nautilus Institute, an artillery attack against Seoul would likely result in 3,000 deaths in the first few minutes, and up to 30,000 deaths within a short period of time thereafter, along with massive damage to infrastructure. Aside from the short-range missile threat, North Korea possesses medium range missiles, such as the Nodong missile, that can hit all of South Korea and most of Japan. Importantly, the Nodong missile is believed to be able to carry a small nuclear weapon. The nuclear threat is the most prominent reason for worldwide concern about North Korea, which currently is believed to have between six and eight nuclear weapons. This problem has direct implications for the United States. In 2015, Army General Curtis Scaparrotti, the current U.S. commander in South Korea told the Senate Armed Service Committee that he believes that North Korea has the capability to place a nuclear warhead on a long-range missile that could hit the United States. The sophistication of North Korean nuclear weapons capabilities has been increasing. North Korea’s first nuclear test in 2006 resulted in a yield of less than 1,000 tons of TNT, however by the third test in 2013 was estimated to have a yield of 6-40 Kilotons. Beyond nuclear weapons, Joseph Bermudez Jr. estimates North Korea to have between 2,500-5,000 tons of chemical weapons agents such as chlorine and mustard gas, hydrogen cyanide, and sarin. Expert estimates vary about the effectiveness of the DPRK military; however, given the short distance between the front line DMZ forces and the 25 million plus residents of Seoul, as well as the numerous asymmetric capabilities that the DPRK possess, the DPRK has the potential to wreak devastating human and economic damage on South Korea. Since the end of the Korean War and the signing of the armistice in 1953, a state of mutual deterrence has existed, but this state has depended on the strength of the U.S.-ROK alliance. However, despite this deterrence, the DPRK has proven willing to commit violent provocations resulting in U.S. and South Korean casualties. The two most recent examples of this tendency is the 2010 North Korean sinking of the Cheonan, which killed 46 ROK seamen, and the 2010 North Korean shelling of Yeonpyeong Island, which killed four ROK citizens and wounded an additional three civilians and fifteen soldiers. Many North Korean provocations do not result in physical damage, but are intended to register displeasure with the U.S.-ROK alliance and to increase tensions on the Korean Peninsula and in the region, such as firing missiles into coastal waters during joint U.S.-ROK military exercises, or most recently firing two short range missiles off of its western coast two days before U.S. Secretary of Defense Ashton Carter visited Seoul. While some dismiss America’s East Asian alliances as a holdover from the Cold War, in the case of the U.S.-ROK alliance it is clear that the original purpose has not lost meaning, because even as ROK capabilities have grown, the DPRK still has manifest hostile intent and large conventional and asymmetrical capabilities that are more than a paper tiger threat to South Korea and the region. The alliance is about more than just deterring Pyongyang. North Korea and the Diplomatic Utility of ViolenceIf North Korea Collapses, What Happens to Its WMDs?Don't Expect Too Much From Inter-Korean DiplomacyMaritime Tensions Reveal Troubling Status Quo in Inter-Korean RelationsWho’s Right About the New US-South Korea Joint Military Exercise?